Photo courtesy of WSU Athletics Balanced scoring leads Wright State to fifth conference victory. Emily Vogelpohl takes the ball down the court. FAIRBORN — The Wright State women’s basketball team hit the court against Cleveland State for the final game of their three-game road trip on Jan. 20. After giving up the lead built early in the game the Raiders battled back over the next three quarters to win against the Vikings by a score of 70-65. With the win the Raiders move to 14-5 overall and 6-1 in the Horizon League. Five Raiders scored in double-digits with center Tyler Frierson leading with 14 points. Symone Simmons pulled in 13 rebounds while also adding 13 points. Michal Miller contributed another 13 points while shooting 3-5 from behind the arc. The Raiders started off the game with a statement against the Vikings, scoring the first 12 points of the game. Tyler Frierson made two layups, Symone Simmons made one layup, and Mackenzie Taylor and Michal Miller each sank a three-pointer before the Vikings even got a point on the board. Cleveland State’s first points of the game came off of free throws from a Raider foul. One Viking jumper would pull them back within eight points, but an Imani Partlow layup would extend the Raider lead to double-digits with 4:34 remaining in the quarter. Cleveland State would put in four consecutive points before the short run was broken by an Emily Vogelpohl layup. Cleveland State was the first to strike in the quarter with a three-pointer by Isabelle Gradwell which cut the Wright State lead to five. Imani Partlow would hit a layup for the Raiders on the next possession but the Vikings would sink another three-point shot to pull within four points. Two critical fouls gave the Vikings a chance to pull even with the Raiders. Vikings Mariah Miller would convert all four of her shots and tied the game at 18-18 with 7:51 on the clock in the half. At the 6:53 mark Cleveland State would take their first lead of the game off of a Rachel Slaney layup. On the next possession Mackenzie Taylor would convert both of her free throws from a Viking foul to even the score once again. The remainder of the quarter would be a back and forth scoring effort by both teams. Emily Vogelpohl made two shots, Imani Partlow made one layup, Mackenzie Taylor made one layup, and Michal Miller would add a layup as well as a three-pointer. Although the Raiders scored 11 points in the last 3:27 of the quarter the Vikings had their own answer each time and the score would remain even at 33-33 entering halftime. After losing their lead built early in the first quarter, the Raiders hit the court in the second half looking to build up the lead once more. Tyler Frierson was the first Raider to score in the half, putting in both of her first two shots. Frierson’s scoring and rebounding would spark a 10-3 run for Wright State. Symone Simmons put together an impressive 58 second run to aid the Raiders. After sinking two layups Simmons also forced a steal off of which she was fouled and sent to the line. Simmons would convert both of her subsequent free throws. Over the next 5:16 the Raiders would enter a scoring drought that allowed the Vikings to make a comeback. Over that period Cleveland State would score 11 points and also regain the lead. Emily Vogelpohl would put the Raiders back on the board and Mackenzie Taylor would add a three on the next possession, however the Vikings would lead 49-48 to the end quarter. Emily Vogelpohl opened things up for Wright State in the quarter and for a short time give the Raiders the lead. Until the 6:46 mark of the quarter the two teams would trade points and end up tied at 53-53. If only for a short while, Symone Simmons broke the tie with a layup before the Vikings put in their own shot. On the next possession Michal Miller broke the tie with a shot from behind the arc but the Vikings would score the next five points to put the Raiders behind 58-60. A Symone Simmons layup would tie the game at 60-60. The Raiders would score the next six points and would not relinquish their lead for the remainder of the game. Michal Miller and Emily Vogelpohl would each add a layup and Tyler Frierson would add four points during that time. Taylor Mackenzie ended the Vikings comeback bid with six seconds remaining by converting both of her free throws. The Raiders will be back at the Nutter Center for a four game home stand 7 p.m. Friday, Jan. 25 against Oakland. 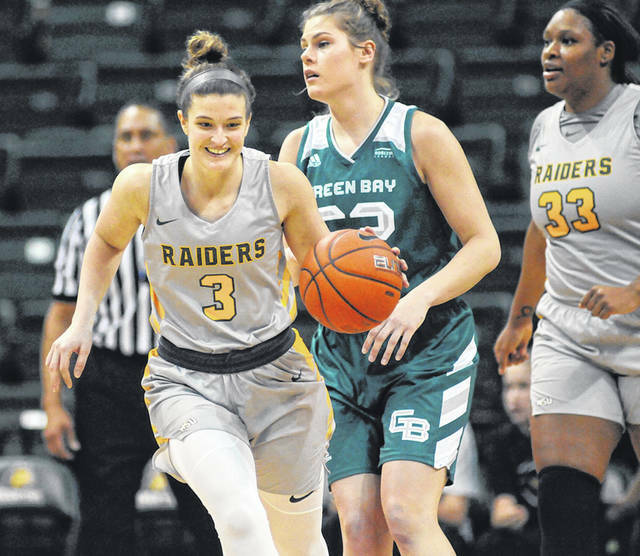 https://www.beavercreeknewscurrent.com/wp-content/uploads/sites/49/2019/01/web1_WSU1_ne2019122103819182.jpgPhoto courtesy of WSU Athletics Balanced scoring leads Wright State to fifth conference victory. Emily Vogelpohl takes the ball down the court.